The SEH 17th European Congress of Herpetology is dedicated to the memory of Olivér György Dely, the great Hungarian herpetologist, curator of Herpetology Collection of the Hungarian Natural History Museum for more than 50 years. Olivér György Dely was born in Nagyszalonta (today in Romania) on the 27th of April, 1927. He studied in schools of Nagyvárad, Nagyszalonta and Budapest. He studied museology on the Péter Pázmány University in Budapest, and started to work in the Herpetology Collection of the Hungarian Natural History Museum in 1950. He published 83 scientific papers, mainly on the members of the Hungarian herpetofauna discussing them from taxonomic and systematic point of view. In 1956 the Herpetology Collection was destroyed by a fire during the political revolution, and nearly 40.000 specimens preserved in alcohol – including type specimens – burned to ash. In the next decades, through exchanges, donations, and collecting trips, Olivér György Dely rebuilt the collection. Thanks to his devoted work, the Herpetology Collection now owns nearly 20.000 specimens. 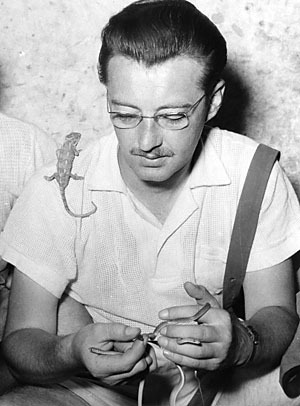 Besides replacing the collection with material representing the herpetofauna of the Carpathian Basin, he conducted several expeditions to Egypt, North-Korea, and Algeria, where he collected hundreds of specimens enriching the Herpetology Collection of the Hungarian Natural History Museum. In 1981 he organized the First Herpetological Conference of the socialist countries, and in 1991, as the honorary president, he participated in organizing the 6th SEH European Congress of Herpetology in Budapest, Hungary. Olivér György Dely passed away on the 19th of November, 2003. In 2013, on the 10th anniversary of his death the 17th SEH European Congress of Herpetology will be organized in Hungary to honour his life and achievements in herpetology. Olivér György Dely in a collection trip in Egypt, in 1957.